He does it with candor and frankness, but it’s not easy, that much is immediately clear. The 36-year-old Marine Corps and Army veteran is the recipient of the Medal of Honor, the military’s highest award for battlefield bravery, a distinction that is a privilege, but also at times a burden. On Oct. 3, 2009, during a year-long deployment to Nuristan province, Afghanistan, Carter was involved in the Battle of Kamdesh, when a force of roughly 300 Taliban fighters assaulted the American Combat Outpost Keating. The attack led to one of the bloodiest battles of the war in Afghanistan and resulted in the deaths of eight American soldiers, 27 casualties, and 150 enemy combatants killed. A specialist at the time, Carter repeatedly exposed himself to enemy fire in his efforts to rescue his fellow soldier, Spc. Stephan L. Mace, who tragically succumbed to his wounds. During the battle, Carter raced into the open to treat Mace, then returned to his position of cover in order to coordinate a rescue, before once again running into the open to carry the wounded man to safety. Afterward, Carter again ran through enemy fire, this time to retrieve a radio from a fallen soldier, in order to notify their command that the defenders were alive, and that Mace was wounded and in need of medical aid. After 12 hours of brutal combat, two Medal of Honor recipients emerged from the Battle of Kamdesh, Army Staff Sgt. Clint Romesha, and Carter, who was awarded the Medal of Honor in August 2013. Born in Spokane, Washington, Carter enlisted in the Marine Corps in 1998 before leaving active duty in 2002. Six years later, Carter returned to military service when he enlisted in the U.S. Army as a cavalry scout. In 2014, Carter left the Army as a staff sergeant, and currently lives in San Antonio, Texas. Now, Carter works as a motivational speaker, sharing his own experiences and struggles with post-traumatic stress and survivor’s guilt, which he says is painful at times, but worth it if his story helps others. As one of just 11 living recipients of the Medal of Honor from the war in Afghanistan, Carter is part of a very small group of veterans who know what it’s like to have their sacrifices and hardships so publicly shared and widely discussed. Carter spoke with Task & Purpose about his experience as a recipient, what the award means to him, and what it’s like to retell the story of that day. 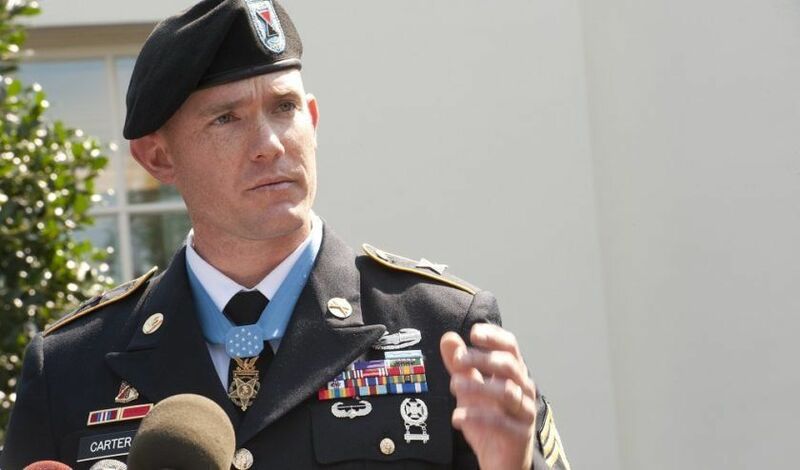 Can you describe what it’s like to speak in public as a Medal of Honor recipient? Wow, what it’s like? Nerve-racking. Well, the thing is, most people when they get up to speak, they have a presentation to make or they’re trying to sell something, and it’s them representing themselves, but once you’re a recipient and you put the medal on, you’re standing up and speaking and you’re representing not only the military, but you’re also representing the Medal of Honor society and foundation. But most importantly, the greatest fear comes from the fact that you represent the men who fought next to you, and died next to you, trying to save your life and you do everything you can not to dishonor their memory, and especially not to dishonor or disrespect the families that were left behind … The only difference between myself and the men I fought with that day is that I am burdened with the medal and that I survived. So it’s completely and totally nerve-racking, but it’s also very necessary to, I guess, educate people. That’s the best way I can say it. In a March 2014 speech in Vancouver, Washington, you made the comment that “hearing the citation read aloud was a very graphic reminder of what happened that day.” Can you tell me a bit more about what it’s like to hear that story retold? Part of what I do now is I’m an educational and motivational speaker, and I force myself to retell the story. The citation may represent a fraction of what happened that day. It only represents the specific parts that I did. I usually request the citation to be read before I speak. For one thing, the first time it was read was at the White House when I received the award, and it also frames what the medal is, because most people don’t know what the Medal of Honor is. But every time I hear the citation — I don’t read it through all the way — it definitely puts me back to where I was that day, and that kind of pushes me to talk about what happened that day. … I’m catapulted back there, but once you get started into it, the memory flows and I can describe in detail every single event and that’s what I do when I speak. That’s nerve-racking, but it’s also painful. I’m pretty much reliving one of the worst days and worst moments of my life, but if it helps others and educates others, then it’s worth it. When you relive it and you have to share it publicly, that’s hard to do, right? Is there a catharsis that comes with that? By speaking and telling the story, it’s a therapy for me. It helps me through my stress and it also chips away from the survivor’s guilt I have. At that position, out of the eight, five were either killed or mortally wounded, so when you watch that and you know what happened all around you, you know what these guys did to help save you, you feel like you have to tell people what these guys did. It’s never a “have to,” it’s always a choice. I don’t like doing it. It hurts every time I speak about it, but I think it’s necessary. It helps me out. The story of that day, it’s public, it’s been covered a lot, does it still feel like your story? I don’t think it was ever my story. … I mean the citation and the articles and everything else, that’s only from the guys that were interviewed, what about the guys that weren’t interviewed, but also witnessed the atrocities? I use my story, or my part of the story, to educate people. But in the end, it’s more of the unit story. If it wasn’t for the guys on the other side of the compound we would have been overrun, if it wasn’t for us, we would have been overrun, if wasn’t for the aviation units coming in when they did, we would have been overrun. All I know is I tell the story of what happened from my eyes. After you learned that you would receive the Medal of Honor, what was your initial reaction and did it take some time to process? Well, shoot. When I knew that I would receive it, or when I knew I was nominated? We’ll do both, if you can tell me about when you knew would be nominated for it, and when you found out you would receive it. I was informed I was going to be nominated a couple of weeks after the firefight in Afghanistan, while we were still deployed and I was very upset. Very angry. We were about to attend a memorial for the eight men who died. I didn’t really know what the medal was, so I kind of got big headed, I guess you could say. Then after a while, knowing about the nomination and others knowing about the nomination, became kind of a hassle. So when I went to my next unit in Fort Lewis, the sergeant major and the lieutenant colonel in charge who knew about the nomination, we all agreed it wouldn’t be mentioned. In my new unit, I wanted my men to know me for me and my leadership ability, and respect me for that, versus an action or an act that happened a few years back, and it worked out very well. It’s going to take several years, so I tried to live my life as if I wasn’t going to receive it, so I could continue doing my job as a scout. But as soon as I got the call, they removed me from my unit, they put me with the secretary and the general’s staff, so I could assist in the building of the website, flew me to the Pentagon so I could receive media training, how to say things, and what not to say, and all that kind of stuff. When the announcement was made, it was a roller coaster of interviews, and my job as a scout — the job I signed up for — was pretty much removed and I became a public affairs representative, and a few months later, they unofficially named me a spokesperson for mental health for the U.S. Army, and that was what my job was. I was supposed to travel, make appearances, and speak about the firefight. … Whatever my life was before the medal no longer existed. I guess the best way I can explain it is all through your life you’re trying to earn respect. You’re trying to get to the point where people just acknowledge, and you don’t have to prove yourself. Once the medal was placed upon my neck, for people who knew about it, I didn't have to prove myself. I didn’t have to do the whole alpha male thing. I don’t have to fight for respect, it’s just given, and people who don’t know about the medal, they pretty much treat me like I’m a normal person, not acknowledging, and when I don’t have the medal and I’m just home doing my own thing, I’m just like a regular person. … In the end when I’m not working or when I’m not doing the whole speaking thing, I can disappear, and fade away, and be normal. How has your perspective changed since you first found out you’d be nominated for the Medal of Honor to now. I learned a lot about politics. The public affairs people told me that the Medal of Honor is a military medal, but it’s also a political medal. … When I received the medal I was talking and shaking hands with all these generals and politicians, and all these people. … I’ve been privileged to pretty much just be there and listen. I don’t consider myself anything like them. I mean, politicians they had to work for years to get where they are. Generals even more. Actors, actresses, athletes — they worked their whole lives to be where they are, and they’re incredibly impressive, and here I am, you know, I did a few stupid things on a very bad day that ended up helping some people and now I’m in the presence of giants. So it’s very eye opening and I’ve enjoyed that part. Were you ever concerned that there might be a risk of losing perspective, or did you always feel pretty grounded? I’m always concerned that I’ll lose perspective. That’s one of the reasons why I still wear my memorial bracelet is that everything I have now, everything that’s going on is because of what those men did. I have a hearing aid for my ear, because I have tinnitus. That’s a reminder. I still keep in contact with some of the families of the fallen. … I’m always worried that I’ll disrespect or dishonor the fallen, that’s why I try to keep them close and try to acknowledge them every day. For yourself, do you view the Medal of Honor, as a privilege, a burden, an honor? Or a mix of things? It’s all three. The burden part is that you represent something more than yourself. You represent the men who fell and the families that were left behind. The privilege is being able to meet interesting people, and the honor of having the highest award for valor, but in the end it’s more of a — I don’t know how to describe it, other than now that I have it and I’ve received these privileges, I feel that I need to earn them, or continue to earn them, by traveling. I can’t stand traveling. I don’t like standing up there and speaking, but I do it anyway. These are the purposes, these are the tasks that are now my responsibility because I carry the medal. When I was able to do my job, I miss it. When I was able to train, when I was able to go to the shooting range and lead Joes. That’s what I signed up for, that’s what I love. After the medal, I was kind of inadvertently told that wouldn’t happen anymore. They kind of just made me a spokesperson, but I do miss that part. 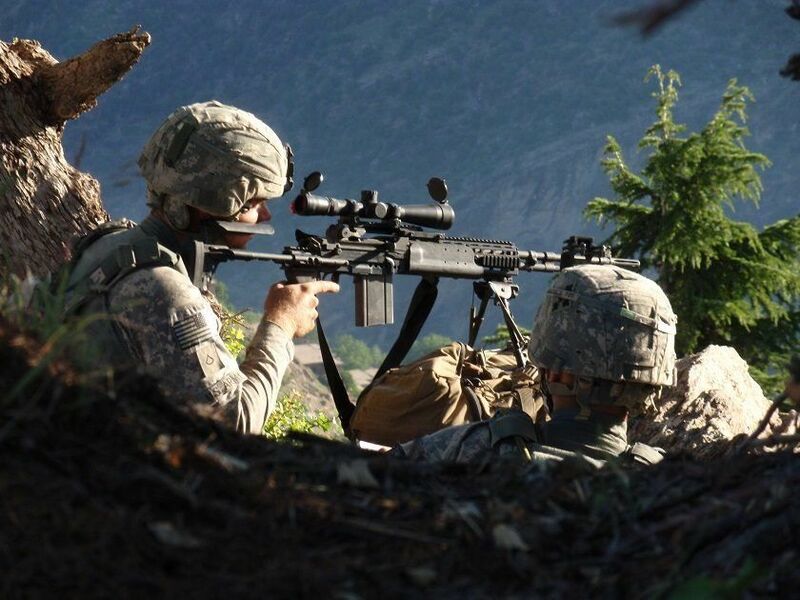 I miss getting up every morning, and making guys, or helping to make guys stronger or more intelligent on the things that will keep them alive in combat. That was something I enjoy, and I do miss that. Do you miss being at war? If I knew that nobody would die or get hurt during a war, which is impossible, then I would miss the camaraderie, the trust. I miss the fact that if anything bad happens, you have the ability to defend yourself; you have the ability to defend somebody else. There’s no politics in a war, it’s your own boots on the ground, and you have orders, and you go. I miss the guys, but as soon as somebody gets hit or injured, it all becomes real and it’s not fun anymore. Your own mortality is thrown into your face as you're watching your own brothers bleeding or hurting. … But when somebody gets hit, the reality sets in and you realize it’s not fun. There’s the part that I’ll miss and the part that I’ll never want to see again.